Powers/Abilities: Superhuman strength and invulnerability. 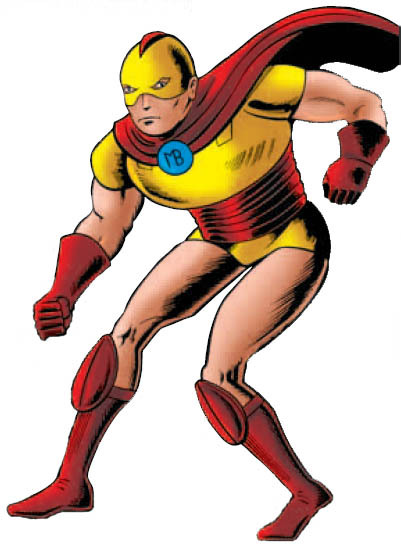 His costume provides enhanced intelligence ("wisdom of Abe Lincoln"), superhuman speed ("speed of Mercury") and the ability to fly. History: (U.S.A Comic #7, g.a.) Martin Burns was a youth who gained powers when the mummified remains of Hercules (!) fell on him during a museum visit, and the dead demi-god's "extract" entered his body through a wound he had received. That night he was visited by a Shadow, which informed him he now possessed the spirit of Hercules, and so he put on a costume, and went out to fight crime. Comments: Created by Bob Oskner. 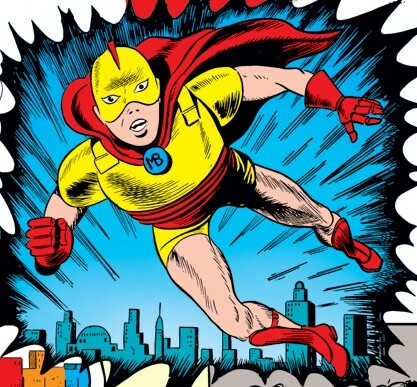 Originally he had no middle name, but in his Official Handbook of the Marvel Universe entry was given a middle name honouring his creator and distinguishing him from the other Martin Burns Marvel Boy.